I like to take each holiday as it comes. What that means for me is that there isn't any Christmas, until Thanksgiving is over. Now, if I happen to see the perfect gift form someone in August, I buy it. But our Christmas tree and lights don't go up until the turkey is put away. With that said, today kicked-off the beginning of the holiday season for me. That means I need to get myself organized so that everything that needs to happen before December 25th, happens. If Christmas isn't your holiday, these tips work for Hanukkah, Kwanzaa and the Winter Solstice too. The first thing you need is a monthly calendar. Start putting those party invites, caroling nights, and ugly sweater potlucks on there right away. To streamline your calendar, try and make a decision about an invitation as soon as possible. If you say yes, be sure to put it on your calendar with the time. If the even needs you to pick up something or prepare something, put an alarm in your phone to remind you in enough time to get it done. Size up your gift list. Now is the time to make sure you have everybody's latest sizes. Haven't seen your nephew for a while? Call and ask, because kids can change sizes seemingly overnight. I keep a note on my phone with everyone's sizes. This way I always have it with me, and I can email it or text it to someone that may need it. Consider streamlining gifts for your kids, and getting them something they want, something they need, something to wear and something to read. Speaking of lists, make a master gift list. Write out everyone's name that you intend to buy a gift for, including teachers, the bus driver, your personal trainer, etc. Then jot down ideas. Both of these tasks will make shopping much easier. Once you purchase a gift for someone, put a star next to it, so you know it's purchased. Consider keeping your holiday decorations simple. Your home doesn't have to look like a holiday store display. That's certainly fine if it's what you love, but don't fall victim to the Pinterest pressure. Pay attention to some of the monochromatic, or simple styles highlighted on DIY and home decor Instagram accounts. I'm trying for rustic-glam this year, and also going heavy on the red. Wrap it up. Decide on a theme for wrapping your gifts, and buy all your supplies now, so you are ready to wrap, Last year, I bought black kraft paper and did a chalkboard theme for wrapping gifts. The roll was SO BIG, that I have plenty leftover and I'm planning to use it again this year. I'm on the hunt for some red plaid ribbon and little green sprigs to change it up this year. So those are the 5 ways I am planning to get organized for the holidays right now. What keeps you organized during the holiday rush? This post is linked for Motivation Monday. 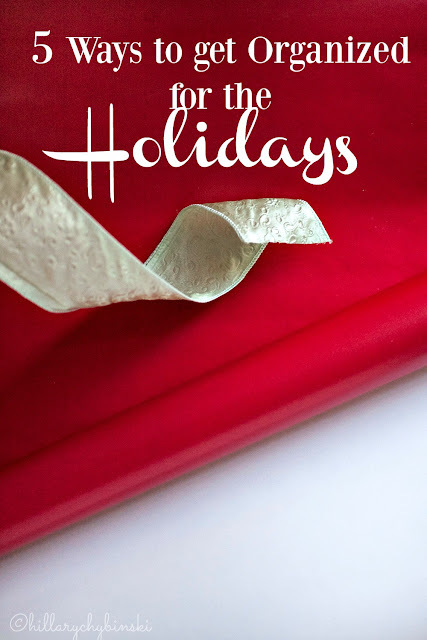 Love the gift wrap theme you have, and thanks for these great tips!